Sneaky Art is more than a book, it is a concept. Written, illustrated and thought up by Ontario born author Marthe Jocelyn, children are invited to create and hide tiny masterpieces to delight whoever may find them. The text is clear, well laid out, and offers approachable directions. The photographs are bright, engaging, and they draw readers into the projects and the positive purpose behind them. As this is surely a hobby that could get addicting, it is fortunate that Jocelyn provides an accompanying website for ongoing sneaky inspiration (www.sneakyart.com). The site also has teaching resources, “free ideas,” and information on workshops for students and professional development for teachers. 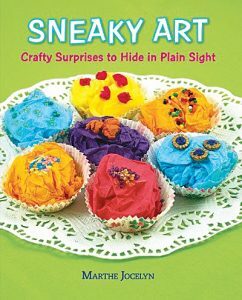 Sneaky Art: Crafty Surprises to Hide in Plain Sight is a multi-purpose book just waiting to be explored. The content, concept and humour quickly appeal to students of all ages. Sneaky Art would be useful in a variety of curricular applications, from primary fine motor skills to intermediate expository writing. This Canadian children’s book has loads of inspiration to offer and would make a popular addition to any classroom library. Recommended.